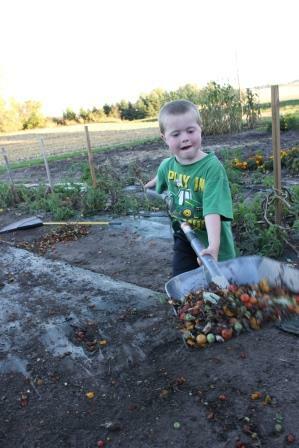 With the weather changing and getting colder, we have worked hard to clean out the garden. 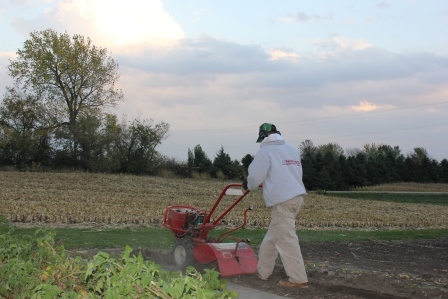 We also wanted to complete as much work as possible before the weather turned colder, and before it rained. We were fortunate to receive 1 3/10″ of rain this past week. As we cleaned up the garden, some of the produce that was passed its prime was fed to the chickens. They absolutely love this! Keith’s first time having the responsibility to drive the lawn tractor to move supplies after pulling up the mulch and stakes etc. Can you tell, he was a little over joyed at this new privilege and responsibility. We shed the plants to break them down faster so they become nutrients for the soil. The kids have been given strict safety instructions and wear ear and eye protection. It definitely is no surprise, that if you have a cool, fun tool the boys are definitely more interested in the project. 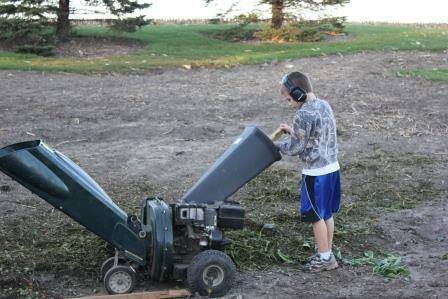 Keith wanted to shred his giant kohlrabi experiment. 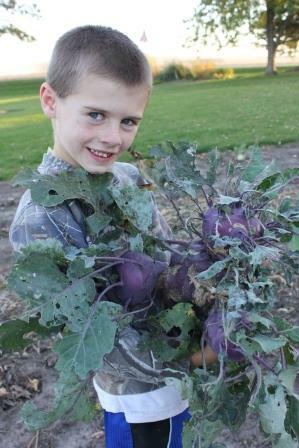 It was funny to see that the main kohlrabi grew about four baby kohlrabi on the original plant. They think it is so cool to shred the different vegetables. 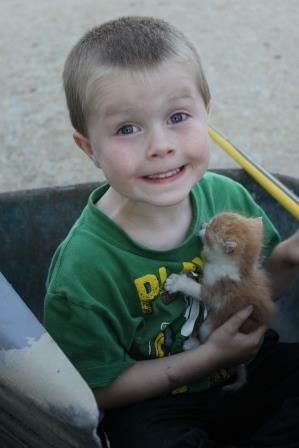 While all of this is going on, Sam makes sure to take time to tame the kittens and bring them down to see what is going on. The shredded materials were tilled in and a seed bed was prepared so that we could plant a cover crop. 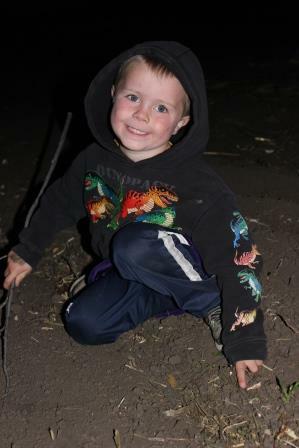 This year we planted rye grass and tillage radishes. 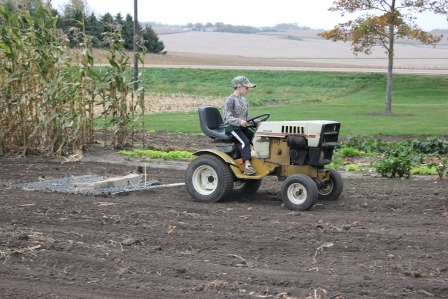 We hope that the rye grass will provide some good nutrients as it grows this fall and then again in the spring and that the radishes will provide some needed aeration to the soil. We are also curious to see if any of this assists with insect control (ex. potato bugs) as well. 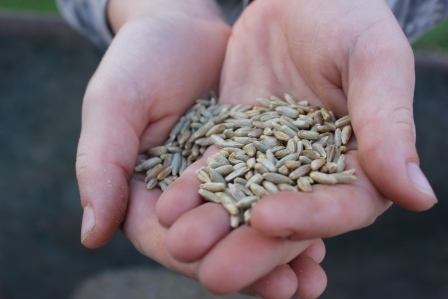 In the end, we hope the results will provide better plant health and better plant production next growing season. Pictured is Keith showing the rye seed. So after the seed was sown, Keith was very excited to be given the responsibility of dragging the ground to incorporate the seed. Sam checked to see if any of the Marigolds he planted made it through the tilling and dragging. He was happy to see that indeed one did! We believe we will have quite a few Marigolds growing on their own next spring – maybe this will draw in beneficial insects earlier to eat potato bug larva. We have also been checking the progress of the popcorn. 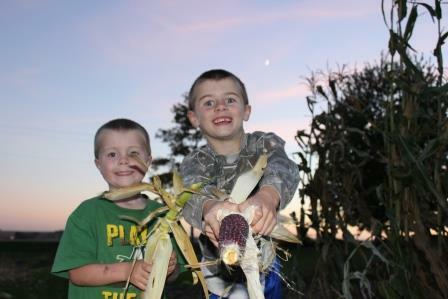 These windy fall days have helped the ears of corn to dry down. We are hoping to shell them at the end of the month. 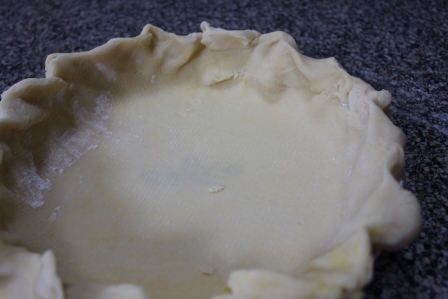 When I was in 4-H, one of my foods project was a pie crust. 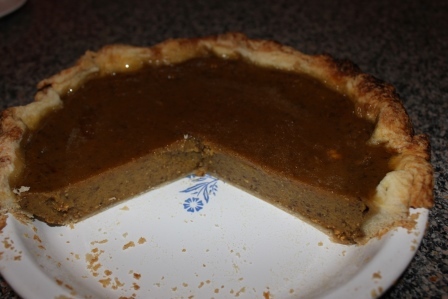 So that summer, I tried countless numbers of pie crust recipes. This is the pie crust that passed the tests of my brothers, my parents and my Grandpa. My poor family had to try so many different recipes over the years. At least I had extremely honest brothers (sometimes to honest) and a very frank Grandpa to let me know what they really thought of the recipes. One of my fondest memories was my deal I made with my Grandpa to be an official taste tester for my 4-H foods projects. My Grandma had passed away before I was born and so this provided Grandpa with fresh baked goods on a regular basis and was frankly a fun way to connect with him. I told him I wanted to win blues if not purples on the 4-H foods projects, and I needed him to be very honest with me and very specific about what he did or did not like about recipes. He didn’t let me down. Over the years, together with my families help and Grandpa’s frankness we were able to accomplish quite a bit of success and some good memories along the way. Cut together flour, Crisco, sugar and salt. Then mix in with fork milk and egg yolk. May be stored several days in fridge. When pie is all assembled brush top of crust with milk to make golden brown. 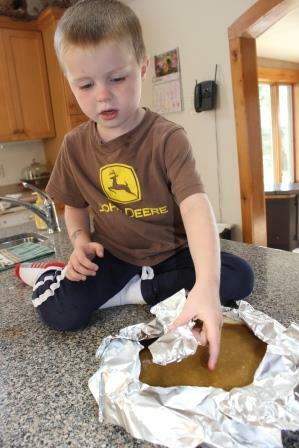 Cover outside edges with aluminum foil, remove with 5-10 minutes left in baking time. This will prevent crust from burning. Adapted from the back of the Festal pumpkin can. Preheat oven to 450 degrees Fahrenheit. Prepare 1 pie curst. Combine eggs, sugar, salt and spices and beat well. blend in pumpkin or squash, add milk and beat well. Pour into pastry lined pie pan. Bake at 450 degrees F. for 10 minutes. Reduce heat and bake at 350 degrees F. for 40-45 minutes. Pie is done when knife, inserted in center, comes out clean. Divide your dough into two balls. Place one ball of dough on a floured pastry cloth. Flatten your ball out with your side of your hand, pressing down on it 3 times each way. Basically looks like tic-tac-toe. Roll out into a circle. 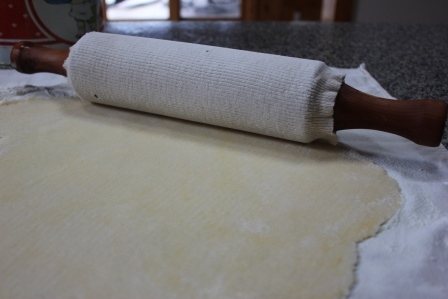 To place into your pie plate, using your rolling pin, start on one side of your dough and gently roll it around your rolling pin. Place it over your pie plate and unroll it over your pie plate. Roll your crust’s edge under to make your crust. I made the fluted edge by pressing my thumb against my pointer finger when my hand was in the shape of a fist. 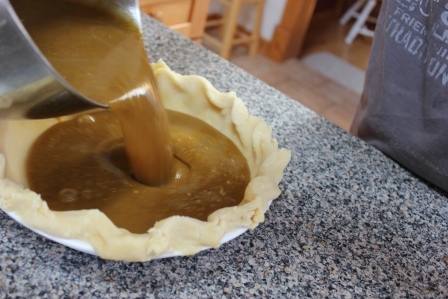 After your pie filling is mixed together, pour it into your pie pan. Cover the crust of your pie with aluminum foil so the crust does not burn. Place in the oven. Sometimes I remove the foil with about 10 minutes left in the baking and sometimes I remove it after I have taken the pie out of the oven. Just depends on how the pie is baking that day. Enjoy the pie with some whipped topping! Happy Baking! 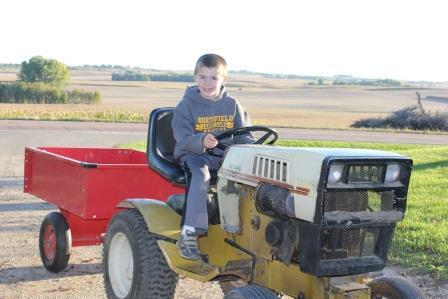 This entry was posted in Uncategorized and tagged butternut squash, CSA, factory farms, family farms, farming, food, Gardening, gardening with kids, kids in the garden, local foods, Northfield, vegetables. Bookmark the permalink.